Damage triggers of creatures killed in combat? What does "holding priority" mean, and is it even a thing? Artifact spells you control cost less to cast. 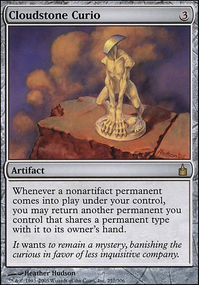 Artifacts you control are Equipment in addition to their other types, and have "Equip : Equipped creature gets +X/+0" where X is that artifact's converted mana cost. Partners with Krash, Vicious Butcher. Equip costs are less if equipped to Krash, Vicious Butcher. 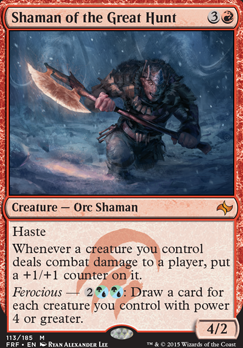 Whenever Krash, Vicious Butcher deals combat damage to an opponent, you may reveal the top five cards of your library and put a card from among them into your hand. Put two onto the bottom of your library in a random order and the other two into your graveyard. Partners with Ishbul, Cunning Inventor. Make a Lord for a tribe that is outside of their traditional color range. For example, a black Elf or an Azorius Dragon. Feel free to use the extension of the color range in their identity (In an activated ability, for example) so that the casting cost of their mana fits in the deck's mana base. 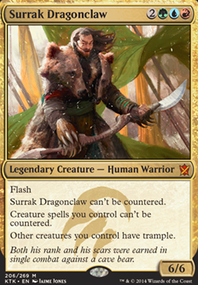 For example, the Dragon might be red in casting, but Jeskai in Identity for having an Azorius activated ability - Similarly to how creatures like Shaman of the Great Hunt are designed. For card draw, Prime Speaker Zegana, Pull from Tomorrow, Bident of Thassa, Blue Sun's Zenith, Consecrated Sphinx, Nezahal, Primal Tide, Garruk's Packleader, Rishkar's Expertise, Zendikar Resurgent, Biomantic Mastery, Shaman of the Great Hunt, and Tishana, Voice of Thunder. Other cool cards: Avenger of Zendikar, Craterhoof Behemoth, and Birds of Paradise. Cards to take out: Permeating Mass, Reef Worm, Soul of the Harvest, Phyrexian Ingester, Majestic Myriarch, Lifespring Druid, Grand Warlord Radha, Engulfing Slagwurm, Druid of the Cowl, Urban Burgeoning, Mind's Dilation, Kefnet's Last Word, Saheeli's Artistry, Fog, and Harrow. 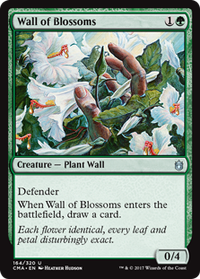 Basically for the purposes of EDH/Commander deckbuilding, it doesn't matter if you're only going to play a card using a certain color, or only half of a split card, or whatever. If you want to include cards like Far / Away, Archangel Avacyn Flip, Shaman of the Great Hunt, General Tazri, or Creakwood Liege in a deck, you need to care about its color identity. Each of these cards has a color identity that is a sum of all its parts, not just what is in its casting cost. 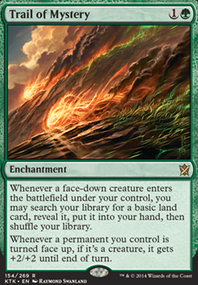 Far / Away is UB, so you can't run it in a mono-blue Commander deck just because you aren't planning to ever play Away. Archangel Avacyn Flip is RW because you count the back side of the card in the color, so it can't go in GW decks. 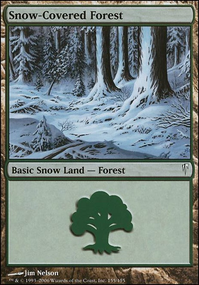 Creakwood Liege is still GB, even though you could cast it with just one of those colors, so it can't go in your Gruul deck. General Tazri is five-color, so you need a five-color deck. 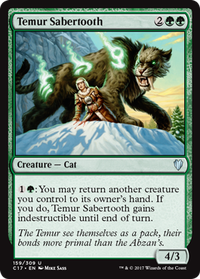 And your Shaman of the Great Hunt needs a Temur deck (or more) to work. Limitations like this make deckbuilding interesting and a challenge. Of course, there are always the people who just find the cheapest five-color commander they can just so they can avoid the color identity problem and end up playing 99-card singleton instead of actual EDH. Of course, your particular group is always welcome to houserule it so that you could run Shaman of the Great Hunt in your deck. The reason Extort is exempt from the color identity is because the mana symbol only shows up in reminder text, and reminder text isn't always guaranteed to be printed on the card--see Air Elemental (M19) versus Air Elemental (Ixalan). Commander cares about colour identity, which is distinct from the colour of a card. A card’s colour is defined by the card’s mana cost, or colour indicator if applicable (a dot next to the card type, like the Blue one on Ancestral Vision). 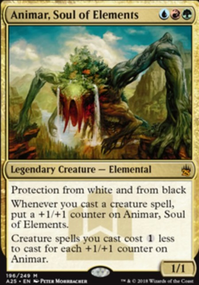 Colour identity looks the colour indicator and at all the mana symbols on the card - both in casting cost and rules text - except those found in reminder text (such as the mana symbols in Extort’s reminder text). For the purpose of both colour and colour identity, hybrid mana counts for both colours. As such, Shaman has Blue in its colour identity, and can only be played alongside a commander with Blue. Just to be sure, nothing on the stack actually resolves until all players pass priority. Then, topmost object resolves. This means that you can put for example put on the stack 5 activations of Shaman of the Great Hunt without passing priority, but none of them will actually resolve before an opponent can respond, so that is rarely beneficial. If you activate the ability once and pass, and the opponent targets the card with some removal, you can activate it 4 more times in response. Doing it one at a time will prevent you from committing 20 mana to the thing. Now lets imagine the same situation where Shaman is your only creature. If you hold priority, you put 5 activations on the stack, the opponent responds with a removal spell and you draw 0 cards. If you put just one activation on the stack, and then the opponent responds, you will still draw 0 cards, but have 16 mana available for other things. TLDR; Not passing priority is useful, but in very fringe cases.